It’s widely known that the majority of stuck pipe incidents occur while pulling out of hole. 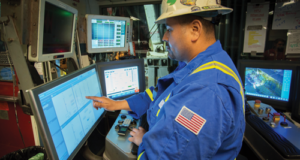 If we can detect where an incident might occur – for example, in a 20,000-ft well – that could mean a radical reduction in nonproductive time (NPT) related to wellbore stability or drillstring integrity. 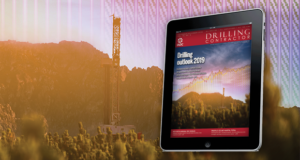 Using a broadband downhole network, the picture we can get, not just of near-bit areas but all along the entire drillstring, has the potential to go high-definition to mitigate drilling risks. 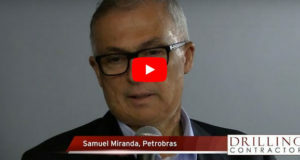 Recent real-time, along-string annular pressure and temperature measurements made in several wells have been so “mind-blowing” that some owners of the data have been hesitant about releasing them, said Maximo Hernandez, VP and GM for NOV IntelliServ. 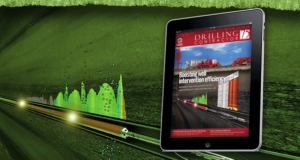 Compared with normally available data from bottomhole measurement tools, these new real-time data sets have the potential to give operators and drillers never-before-seen visibility of the dynamics of drill cuttings cleaning, equivalent circulating density (ECD) and fluid influx/loss issues at multiple points along a wellbore. In many cases, this information is significantly different from traditionally held assumptions. This data can also be used to more effectively manage flow rates, mud weight, rate of penetration (ROP), string rotation and the use of lost-circulation material to reduce the risk of stuck pipe, formation fracture and excessive losses. The successful downhole acquisition of these measurements – in at least five wells drilled in late 2008 and early 2009 – mark a significant milestone for the industry because they provide a potential step-change to the way wells are monitored and managed as they are being drilled and may reduce exposure to incidents and improve drilling performance. The key enabler technology of these measurements is The IntelliServ Network, a high-speed drillstring telemetry network that allows instantaneous upward and downward transmission of data between surface and measurement tools located close to the drill bit. 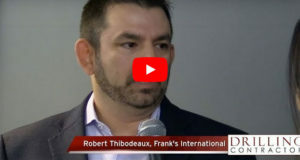 It is virtually a “downhole broadband network,” Mr Hernandez said, which can provide a measurement update to surface every two seconds compared with mud pulse’s one update every three to six minutes. 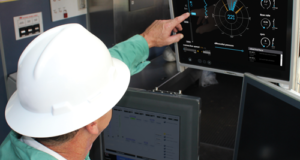 Commands can be sent and verified in seconds, without interrupting drilling and without being affected by mud-flow conditions. This bi-directional nature reduces NPT related to downhole tool communications and improves BHA control because there are no restrictions to when commands are sent. One advantage of the network since its inception back in the ’90s has been its ability to make measurements at its link nodes, which also act as signal boosters along the drillstring and are packaged within a link sub. When the sub is connected to a link pipe, which is shorter than standard pipe, it conforms to the dimensions and specifications of a standard-length drill pipe. 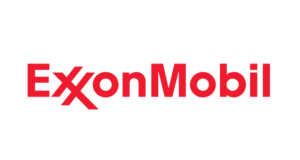 These modules are transparent to the drilling process and can be identified in the field by noting which drill pipe joints have a longer pin-end tool joint by about four feet. Each link is also a processor that allows monitoring of the entire network performance either from the rig site or a remote location. • An interface sub connecting the network to downhole MWD tools. • Network link nodes boosting the data signal and taking measurements at their location along the drillstring. • Drill pipes containing network cable connected by inductive coils at the pin and box ends of the pipe joints. 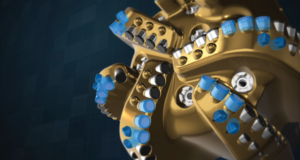 • An intelligent swivel connecting the downhole network to a computer at the surface. Data is sent along the drillstring as packets. Some packets carry data and instructions to and from downhole tools or sensors, and others carry data needed for network functions. • Bending, vibration, and rotation sensors. • Flow-rate sensors, and many more. Sensors that measure rapidly changing conditions may be particularly valuable. For example, annular pressure or a cross-sectional configuration of a wellbore at a particular depth may change during drilling due to formation stability and fluid washout conditions, particularly if the well is overbalanced. As the links move down the borehole, operators can compare an earlier measurement taken at a given depth with one taken later at the same depth. Any necessary actions could then be taken. Other sensors that monitor changing conditions include those that measure wellbore stability, resistivity, ECD measurements, primary and/or secondary porosity, and temperature. Other sensors monitor conditions that do not substantially change over time, such as borehole inclination, pore pressure, the formation’s petrophysical properties, or the fluid in the formation. 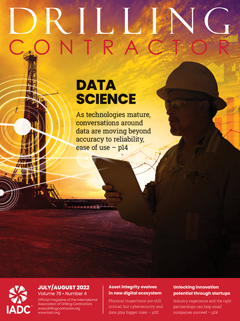 An operator can compare data from different sensors at different times to better determine the actual condition and its possible trend as the well continues to be drilled. For example, because the inclination of a wellbore at a particular depth likely will not change, averaging the inclination measurements at the same depth at different times will provide a more accurate borehole inclination. A broadband network downhole can allow an operator at the surface to take a measurement at a selected time and place. In most cases, however, an operator will rely on data sent from multiple sensors along the drillstring to determine the characteristics of the wellbore formation. Each of those sensors will send a signal at a selected time interval. For example, measurements might be sent at regular intervals so that signals at any depth can be compared with signals from a similar sensor at another depth. In this way, an entire well profile (starting with the first sensor at a given depth) can be plotted by the computer, and a time-lapse plot can be depicted for measurements from a second sensor at the same depth at a later time. This system can potentially accommodate several types of sensors. Some sensors can take reliable readings while rotating in the well. Others require the drillstring to be stopped to obtain data from a stationary position. Still others are used while the drillstring is sliding or rotating slowly in the well, with most of the power to the bit being provided by the downhole motor or rotary steerable device. 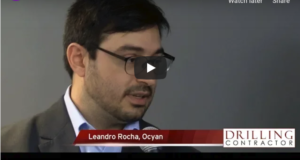 A significant advantage of the system is that it allows operators to analyze information from the sensors when there is a time lapse between a particular measurement at a particular depth and a subsequent measurement at the same depth. As stated previously, the system provides sensors for measuring characteristics at a selected depth in a well. If there are concerns with signals at a particular depth, the operator can monitor all signals sent from that depth in real time. The downhole network transmits information from each sensor to a surface computer. The depth at which each sensor is located is calculated by its position in the drillstring. This enables the surface computer to correlate the output from the distributed sensors to their depth in the well. Information from the wellsite computer can be displayed for the drilling operator on a screen at the well site. Information can also be transmitted to a third-party computer located remotely. This allows others not on the rig to review the data. Sensors placed axially in a wired drillstring send information back to the surface that can be used in various ways. 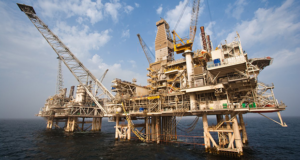 Drillstring components are exposed to harsh conditions that can cause extreme stress on downhole sensors and change their behavior. Any sensor behavior change could affect the measurements and information sent up hole. One useful way to examine distributed measurements information is to plot it on a graph. Placing multiple sensors in the string establishes time and depth measurements as a proportion or an offset of the other distributed measurements under static conditions at any point in time. For example, plotting three borehole annular pressure measurements taken in a static drillstring against time results in three parallel lines with a constant value difference between them. When the drillstring is static, the sensor values (measurements) remain constant and do not change over time. The difference in value between the measurements correlates to the distance between the sensors along the drillstring and the density of the fluid that generates the hydrostatic pressure at each measurement point. When the drillstring starts drilling, the values change as the drill string moves. The relationship between the sensor measurements remains constant while their absolute values change over time. As drilling progresses and formation cuttings enter the mud system, the solids may interfere with the system homogeneity and cause abnormal readings, as well as other phenomena such as sensors interacting in key seating, and avalanching. While mud is in motion, environmental elements can affect downhole sensors measuring annular pressure. Implementing a basic quality control system of differential measurements helps identify any anomalous drift in the measurements. This method involves making certain that all sensors react consistently when a new joint of pipe is inserted into the string at the surface. All the sensors should sense a reduction in pressure as fluid circulation stops while the new stand is being attached to the drillstring. After a few seconds, as the mud pumps are started, the pressure should recover to circulating pressure or even overshoot, which results from breaking the gels as circulation restarts. In early field implementation of the along-string measurement concept, results have been incredible, Mr Hernandez said. Only one case study has been approved for release so far, presented at the 2009 SPE/IADC Drilling Conference in Amsterdam, 17-19 March. • To ensure mechanical integrity and feasibility of the measurement principle, sampling and accuracy. 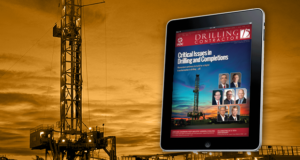 • To evaluate if the system would effectively enable drilling engineers to recognize events. 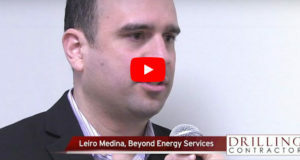 • To enable better decisions when well data is available from places other than the bottom of the drillstring, as is the case with current MWD and LWD technologies. Analysis of the outcome of one of the runs provides the information depicted in the three figures on Page 40. The top figure shows three distributed sensor readings for a span of about three hours. The time-against-pressure plot of the distributed measurements showed a pressure increase as the well was drilled deeper. Connecting a new drill pipe stand to the drillstring resulted in pressure decrease spikes as circulation stopped. Quality control measures consisted of plotting the difference in the three measurements and ensuring that the difference in the three measurements remained constant for ideal conditions. The middle figure plots a set of curves that represent the difference between the measurements. As drilling progressed, these measurements remained relatively constant. Normal boundary conditions were expected to remain constant during the drilling process. These expectations were immediately proven to be incorrect as the drilling progressed. The bottom figure shows an anomaly that occurred at hour 26.3 with approximately 30 minutes duration. A second anomaly occurred 1.27 hours later, with a duration of approximately 10 minutes. On two occasions, the intermediate sensor presented an increase in pressure not seen in either of the other two sensors. Sensor failure was ruled out, as the middle sensor clearly still showed the pipe connections pressure decrease and returned to normal differential (quality) indicators after each event. The slope of the pressure build-up and subsequent pressure release were also consistent in both instances of the anomaly. The slopes in the bottom figure are over lined in blue for clarity. The quality curves demonstrate dependability of the measurements. The interpretation of the anomaly is subject to a few theories, the start of a pack-off, sensor in a key seat, etc, concluding an accurate interpretation will require the aid of further related environmental conditions. Combining logging while drilling, directional drilling, rotary steerable tools and wired pipe in land drilling operations provides significant advantages over traditional methods. Field trials showed that when the drillstring began drilling, values changed as the drillstring moved deeper or shallower. But the constant relationship between the sensor measurements remained while their absolute values changed over time. Solids occasionally interfered with the system homogeneity and caused unexpected readings. A quick quality control method helped ensure sensor measurements were consistent with the environment they are exposed to. This method involved making certain that all sensors reacted consistently when a new joint of pipe was inserted into the string at the surface. On the two occasions that the intermediate sensor presented an increase in pressure not seen by the other two sensors, it did not appear to be sensor failure, as the intermediate sensor still showed the pressure decrease when the pipe was connected up hole. This analysis is certainly not exhaustive of the capabilities of distributed measurements but defines the milestone achieved in measuring and identifying events not seen before in real time in the first prototype runs of the measurement. 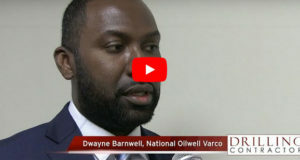 These early wells have shown that while along-string measurements is still a novel concept, it holds enormous potential, particularly in deviated wells, extended-reach wells, underbalanced and managed pressure drilling and deepwater – all of which are becoming much more common in the industry. Finally, Mr Hernandez emphasized that other environment measurements and surface team (driller actions) of the dynamic downhole environment were not made in these early field uses. Additional field applications incorporating these environmental measurements are currently under way. These are a must to obtain an accurate understanding of all events that affect downhole behavior. 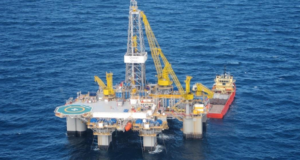 This article is based on SPE/IADC 199540, “Along String Pressure and Temperature Measurements in Real Time: Early Field Use and Resultant Value,” by Maximo Hernandez and Monte Johnson, NOV IntelliServ, 2009 SPE/IADC Drilling Conference, 17-19 March 2009, Amsterdam.